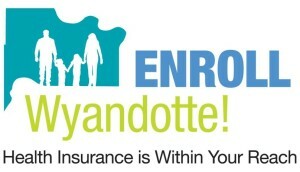 Enroll Wyandotte is a collaborative and coordinated effort of Wyandotte County based health care providers, social services, and local government to perform outreach and to assist with enrollment in health insurance through the Marketplace. You can use Enroll Wyandotte as a resource to obtain health insurance for yourself and your family. The information below can answer your questions and concerns. A contract that requires your health insurer/insurance company to pay some or all of your health care costs in exchange for a monthly payment/premium. But I'm healthy. Why do I need health insurance? You’re healthy now, but emergencies and accidents can happen. People get sick all the time. And health care without insurance can be very expensive; The average 3-day stay in a hospital is $30,000! A bill like that could put you in debt and ruin your credit. Plus, these high medical bills don’t just hurt you. They hurt hospitals and people around you because if you can’t pay your bill, the hospital has to absorb those costs, making health care more expensive for everyone. Your employer may offer it as a benefit, where they pay a portion of your insurance premiums. You may qualify for Medicaid. You may qualify for a special enrollment period outside open enrollment, call us to learn more or visit this page. Who do I call if I need one-on-one assistance finding health insurance? If you would like to meet with someone to help you understand the new law and its requirements, or if you need help with the application process, please call Enroll Wyandotte at (913) 735-9008. What do I need to bring to my appointment with Enroll Wyandotte? Social security numbers and immigration documents of every individual applying for coverage that is not a US born citizen. I'm worried I can't afford health insurance. What can I do? 1 in 6 Americans can get a Health Insurance Marketplace plan for less than $100 a month and 87% of people who selected marketplace plans for 2015 got financial assistance. You file taxes jointly if married. The following table can explain it in better detail. You can use Enroll Wyandotte to help get health insurance! You can schedule an appointment today to meet with our trained Certified Application Counselors. They can walk you through the application process and explain all your health plan options to help you choose a plan that meets your personal and financial needs. Call today!